What this will help achieve? By setting up a specific area for toddler activities and reinforcing the behaviors you expect while doing a project with you, will help to lay the foundation for many positive behaviors later. Your child will learn this is where, when and how they can color using crayons. markers and pencils. This will significantly reduce the occurrence of murals, crayons lost in couches, marks on your furniture, t.v. and other items. Of course getting to that point means monitoring behavior closely and yes...it means sitting with your child and reminding them to put away their crayons, don't put them in their mouths, don't peel the wrappers and so on. Unfortunately, it is not an overnight process however, I can assure you that you will be thankful later! Select an area that you will be doing all craft related activities. Be sure it is free from clutter and children can work without fear of damaging things from spills, or breaking objects nearby. Continually reinforce that ALL drawing is done here on the mat or at the table, not on the couch, not in front of the t.v. etc. 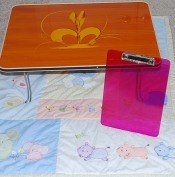 A small nesting table or a low table will provide a nice work space. Clipboards with rounded edges and a flat clip also work well for a writing surface or for holding a paper steady. Shower curtain liners are an inexpensive way to protect floors and carpets and make clean up much easier. A crib blanket or a small mat are great for providing a soft area if you have tile or hardwood floors and for designating a work area. Investing in a sturdy table and chair is well worth it! We used one table and two chairs for both children until they were about 3 and then when our toddler activities became more involved, we got a second table. 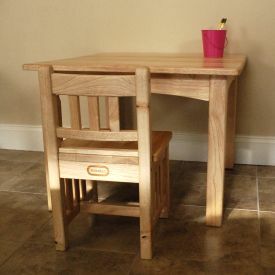 We purchased the Little Tikes Mission Style desk and chairs. We have now used these tables for two years and they are holding up well. They are easy to clean and the chairs don't tip through normal use. In fact the chair is sturdy enough that both my husband and I sit in the chair next to them.